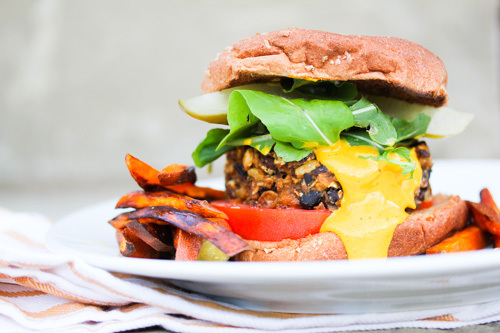 A good veggie burger is a great option for a week night dinner-kids love them and they are packed with protein from the bean and whole grains. The psyllium husk acts as a binder in this recipe replacing the egg you normally find in recipes like these. 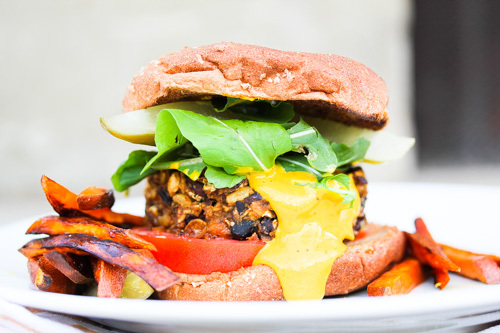 One trick to keep veggie burger patties from being mushy is to bake them first like we have here, and then grill them or saute them in a pan! Mash all the ingredients together until well incorporated. Allow to sit for about 20 minutes before forming into patties. Form into 3” wide patties about 1/2” thick. Bake on a greased cookie sheet for 20-30 minutes. Serve immediately or save for later. If you want to serve later, you can grill on both sides and reheat in the 350 degree oven for 5-10 minutes. Serve on a whole grain bun with lettuce or arugula, tomato, onion, “vegenaise”, raw pickles, and mustard. *Note: These patties freeze very well so if you make too many, you can always have them later! Preheat the oven to 425. Toss the sliced sweet potatoes in the olive oil, salt and pepper. Roast on a baking sheet in the oven for about 15 minutes until golden brown and crispy.Toss with a little more salt to taste after removing from the oven and serve immediately.